Throughout history, Gaza has played a prominent role in resisting the Zionist Enterprise in Palestine, our homeland. Its resistance has accomplished multiple historic milestones, creating distinctive shifts in the forms of resistance. In the 1950s, the organized commando operations first emerged from Gaza, over a decade before the actual dating of ‘At-talqa al-Oula’ (the First Bullet) in 1965. Gaza resisted its enemy fiercely and effectively which ultimately resulted in “breaking down the essence of the Zionist Enterprise,” i.e. settlement expansion. For the first time since the colonization of our land, the Occupation was forced to unilaterally withdraw. Gaza’s resistance has fought through a series of vicious wars, which are considered the greatest and most violent military confrontations the Palestinian people have ever witnessed. 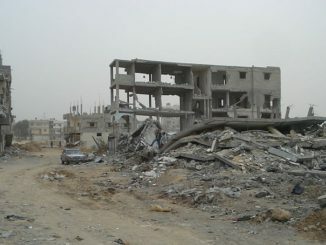 Gaza has achieved great things although it has been under a suffocating ‘Palestinian,’ Zionist and Arab siege. This siege turned the lives of the Palestinians into a living hell – at a time when Gaza fell victim to the regional and international interests in its torn-apart lands. As part of this great legacy of struggle against occupation, the ‘Brave Gazan Personality’ bloomed into existence. Such a personality was a mixture of national adherence and creative resistance. 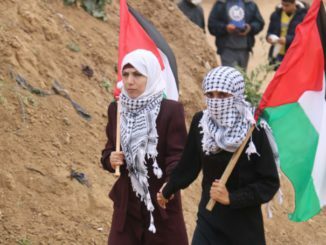 Therefore, now, the Gazans have participated in the Great Return March, which took place on the commemoration of Land Day on March 30; and during which 16 Palestinians were martyred, and hundreds were injured. This March was to propose a political suggestion that aligns with the popular uprisings that have been continuously occurring for almost 5 years. Its purpose was to bring together the struggle to break the siege and redirecting the Palestinian struggle towards its ultimate destination: liberty and return. First: Although the March is somewhat “a decision made by the parties,” it reflects the decision of the people of Gaza. This has been witnessed in the great public participation (across different parties) in the March, and the dream of returning has been set as a realistic goal, unphased by shifting party interests. It is also important to be careful not to limit the Gaza community’s role as “the protector of the resistance parties” and not to ignore its communal participation and role in politics and other forms of struggle. Second: Gaza’s struggle to break the blockade is also in the name of national principles. National principles whose manipulation resulted in what is called ‘the political division,’ which is in fact the result of manipulating the root causes of the conflict and the national principles. 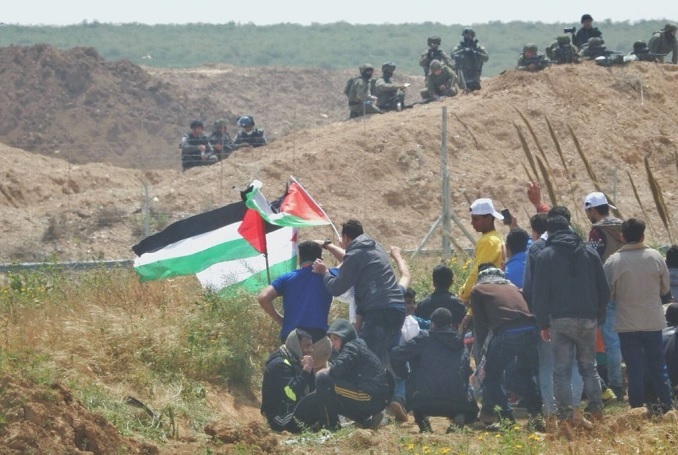 Third: The March represents an actual practice of popular struggle at a time when the Right of Return and the commemoration of the Nakba have become symbolic rituals of folklore. The March calls for the Right of Return – actual return, not a metaphorical one. Its approach is to go beyond real and psychological borders, especially internally. Fourth: Popular resistance is comprehensive and does not believe in the bilateral form of violence and nonviolence. Therefore, popular resistance, whose purpose has been co-opted, must not turn into a justification for implicit nor explicit condemnation of armed resistance. Such attempts are organized to take over the popular resistance, or what is called ‘the third current’ by prominent figures who belong to parties that are at their political deathbeds. Their purpose is to serve the interests of a political perspective that claims to be different from the ongoing crisis and national stagnation. Fifth: There should not be any exaggeration in describing the current state of the enemy as being confused before such “peaceful” means of struggle, nor in declaring how “We are playing in an arena where the enemy feels uncomfortable.” On one hand, the enemy is dealing with the March as a complex security challenge whose level of difficulty remains less challenging than a widespread military confrontation with Gaza, which it tries hard to avoid. On the other hand, the enemy deals with the protesters as “armed” individuals. Since the very beginning, it clearly classified the Great Return March as a military threat, and the orders to shoot and fire present tangible evidence of such a classification. Finally: celebrating our martyrs and their patriotic actions does not mean we do not mind the Palestinian bloodshed, nor does it mean we belittle the great price we have to pay for such a confrontation. Those sacrifices are a burden to whoever takes part in political resistance and compel them to do their best to continue the battle of the martyrs while in the field. 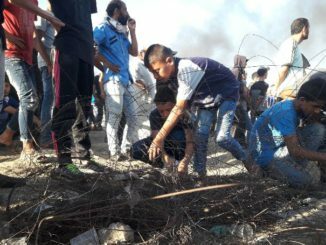 This leads to the importance of breaking our siege – ours – that we imposed on Gaza, since we considered it necessary for Gaza alone to sacrifice greatly. We show our solidarity to it as though we are in solidarity with a neighboring heroic people.